Here’s a great candied nut recipe just in time for the holidays. Many of us spend our time snacking throughout the holidays, or at least my family does. 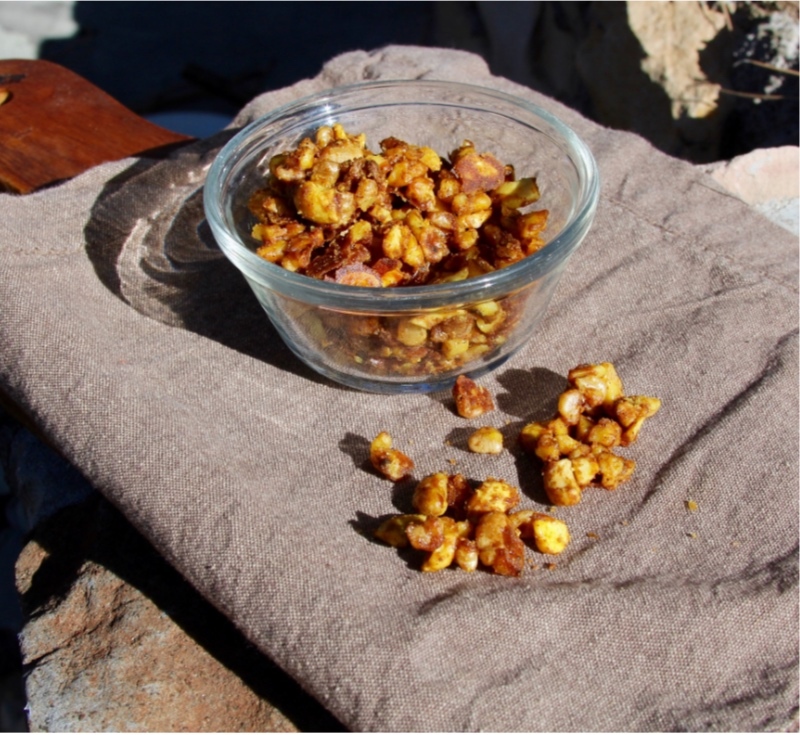 This recipe for turmeric spiked candied nuts is a sweet and savory treat! The little bit of maple syrup adds a subtle sweet taste while the spices add a mild citrus and spice taste. This turmeric spiked candied nut recipe uses cinnamon, ginger, nutmeg, cardomom, turmeric and a pinch of sea salt and pepper. All of these spices are common in baked goods and most are thought of as sweet spices. Turmeric, ginger and cardomom all belong in the same family of plants and help aid in digestion. Nut’s can be hard on the digestive system so adding this bit of herbal help make the recipe that much better. There are two types of cardomom, black and green. Each have different flavors. The green cardomom has a sweeter taste, almost citrus, which is what I used. It helps give these nuts a sweet taste. Along with the cinnamon and maple syrup. All the spices combined help to give the nuts a spicy flavor. Spicy meaning herb type taste not spicy taste. It’s nice to have a little different taste with candied nuts. I used turmeric due to it’s earthy, spicy taste. It also has anti-inflammatory turmeric which helps with countering any inflammation that may happen throughout the day to day happenings. The holiday’s can also bring some stress so giving these turmeric spiked candied nuts the added health benefits as well. This recipe for turmeric spiked candied nuts will be sure to be a favorite around the house. They would also be a prefect gift for someone hosting a holiday party! Place coconut oil/ghee in a cast iron skillet over low heat. Allow oil/butter to melt, place all spices into the pan and stir. Add nuts, stirring to coat and cook for 8 minutes. Add maple syrup and stir well, coating all the nuts. Continue to cook another 6-8 minutes until the nuts become sticky. Remove from heat and allow to cool. Once cooled a bit, enjoy or store in a glass container for later. I use ceylon cinnamon because I consume a lot of cinnamon. In regular cinnamon (cassia cinnamon) contains coumarin which can be toxic in large quantities. Both types have a lot of benefits though. Use any combination of nuts you like. Hazelnuts and chestnuts would be excellent as well. Disclaimer: The information on this website (Alt Yoga Vibe) is for informational purposes only and does not substitute for medical treatment. If you are experiencing any severe symptoms, please consult a healthcare practitioner.